Pearson plc is a British multinational publishing and education company headquartered in London. It was founded as a construction business in the 1840s but switched to publishing in the 1920s. It is the largest education company and was once the largest book publisher in the world. In 2013 Pearson merged its Penguin Books with German conglomerate Bertelsmann. In 2015 the company announced a change to focus solely on education. Pearson has a primary listing on the London Stock Exchange and is a constituent of the FTSE 100 Index. It has a secondary listing on the New York Stock Exchange in the form of American Depository Receipts. The company was founded by Samuel Pearson in 1844 as a building and engineering concern operating in Yorkshire under the name S. Pearson & Son. In 1880, control passed to his grandson Weetman Dickinson Pearson (later 1st Viscount Cowdray), an engineer, who in 1890 moved the business to London and turned it into one of the world's largest construction companies. Another of its prominent engineers was Ernest William Moir who, after working for Pearson on tunnels in New York City, became the contractor's agent on construction of the Blackwall Tunnel under the River Thames in London between 1892 and 1897. The company also built the Admiralty Harbour at Dover, the Halifax Dry Dock in Canada, the East River Railway Tunnels in New York City, the Mexican Grand Canal that drained Mexico City, the Tehuantepec Railway in Mexico, and railways and harbours around the world. In November 1915, the firm began construction of HM Factory, Gretna, the largest cordite factory in the UK during World War I. The construction business was shut down in the 1920s. Among its final projects was completion of the Sennar Dam, in Sudan, in 1925. In 1919, the firm acquired a 45% stake in the London branch of merchant bankers Lazard Brothers, an interest which was increased to 80% in 1932 during the depression years. Pearson continued to hold a 50% stake until 1999. In 1921, Pearson purchased a number of local daily and weekly newspapers in the United Kingdom, which it combined to form the Westminster Press group. In 1957, it bought the Financial Times and acquired a 50% stake in The Economist. It purchased the publisher Longman in 1968. The company was first listed on the London Stock Exchange in 1969. It bought paperback publisher Penguin in 1970, and in 1972, children's imprint Ladybird Books. It bought rival educational publisher Pitman Publishing in 1985. In 1986, Pearson invested in the British Satellite Broadcasting consortium, which, a few years later merged with Sky TV to form a new company, British Sky Broadcasting (BSkyB). 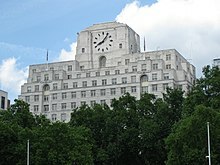 During the 1990s, Pearson acquired a number of TV production and broadcasting assets (including former ITV franchisee Thames Television) and sold most of its non-media assets, under the leadership of future U.S. Congressman Bob Turner. Westminster Press was sold to Newsquest in 1996. Pearson acquired the education division of HarperCollins in 1996 from News Corporation  and acquired book publishers Scott Foresman & Co. in 1996. In 1998 Pearson acquired Prentice Hall Textbooks/Simon & Schuster Trade Books from Viacom and merged it with its own education unit, Addison-Wesley Longman to form Pearson Education. Pearson acquired Dorling Kindersley, the illustrated reference publisher and integrated it within Penguin, in March 2000 and then acquired National Computer Systems (NCS) in September 2000 so entering the educational assessment and school management systems market in the United States. In 2002, Pearson sold its 22% stake in RTL Group for 1.5 billion Euros, and then purchased Rough Guides, the travel publisher, and brought it under Penguin. Pearson acquired Edexcel, a provider of qualifications in the UK, in 2003 and acquired about 80% stake in Meximerica Media Inc for $16.5 million for the swelling U.S. Hispanic market in 2004. Pearson purchased a series of other testing and assessment businesses, including Knowledge Technologies in 2004, AGS in 2005, and National Evaluation Systems and Promissor in 2006. Pearson acquired National Evaluation Systems, a provider of customised state assessments for teacher certification in the US, in April 2006 and announced that it had agreed to acquire Harcourt Assessment and Harcourt Education International from Reed Elsevier for $950m in cash in May 2007. Pearson then completed the acquisition of Harcourt Assessment, merging the acquired businesses into Pearson Assessment & Information. Pearson also acquired eCollege, a digital learning technology group for $477m in May 2007. In February 2008, Pearson announced the sale of its Pearson Data Management Division (formerly the scanner manufacturing and servicing division of NCS Inc.) to Scantron Corporation (part of M&F Worldwide) which had been its main competitor. Pearson acquired Wall Street English for $145m in 2009 and bought the school learning systems division of Sistema Educacional Brasileiro (SEB) for $497m in 2010. Also in 2010, Pearson sold its 61% stake in Interactive Data to investment funds managed by Silver Lake Partners and Warburg Pincus for $2 billion. In July 2011, Pearson announced the creation of Pearson College, a British degree provider based in London. Also in 2011, Pearson acquired Connections Education and agreed to sell its 50% stake in FTSE International Limited to the London Stock Exchange for £450 million. In 2011, Pearson also increased its stake in TutorVista, such that it had a 76% stake, for $127 million. Pearson entered into talks with rival conglomerate Bertelsmann, over the possibility of combining their respective publishing companies, Penguin Group and Random House in October 2012. The houses are considered two of the "Big Six" publishing companies. On 29 October 2012, Pearson said it would merge Penguin Books with Bertelsmann's Random House to create the world's biggest consumer book publisher. Then in May 2012 Pearson announced its acquisition of GlobalEnglish Corporation, an American Business English software and solutions company, in an all-cash transaction. In May 2013, Pearson announced a new restructuring plan to invest in digital learning and emerging markets, after predicting weaker earnings. The change supports the decoupling of the Penguin consumer publishing business into a separate entity with Random House (forming Penguin Random House). The new structure combines the separate education companies, Pearson International and Pearson North America under one Pearson company. Pearson will organise around three global lines of business – School, Higher Education and Professional. The Financial Times Group and Pearson English will form part of Pearson Professional. In July 2014, the company announced it had cut 4,000 jobs, representing 10% of the company's workforce. Pearson announced on 23 July 2015 that it had agreed to sell the FT Group, which includes business daily Financial Times, to Japanese media group Nikkei for £844 million, or $1.32 billion. The sale does not include FT Group's London property at One Southwark Bridge. In August 2015, Pearson's sold its 50% stake in The Economist to the Agnelli family for £469 million who previously held 4.7% of the group. The remaining 50% of The Economist Group is owned by the Schroders, Cadburys and the Rothschilds. On 5 November 2015, the company announced it was rebranding, including the creation of a new logo, with a "100% focus" on education. On 3 July 2017, Pearson sold its Tutor Vista and Edurite lines of business to India-based education technology company, Byju's  On 11 July 2017, Pearson agreed to reduce its holding in Penguin Random House to 25%, by selling a 22% stake in the business to Bertelsmann. In August 2017 Pearson announced that it would cut 3,000 staff in an effort to save £300 million annually. On 16 August 2017 Pearson sold the language training subsidiary Global Education to Chinese company Pu-Xin Education for £62 million. In November 2018 Pearson announced the launch of the Pearson Alumni Network. Global lines of business: focuses on the School, Higher Education and Professional areas (includes textbooks and digital technologies for teachers and students). Pearson's school brands include BTEC, Bug Club, Edexcel, Fronter, GradPoint, Schoolnet, and SuccessNet. Pearson's higher education brands include eCollege, Mastering/MyLabs, Revel, online tutoring (Smarthinking), and Financial Times Publishing. Concerns exist around the amount of influence Pearson, a commercial company, has on public education. Other concerns are around tax avoidance, the high value contracts, and in one instance, laying off teachers to offset the high costs of testing. In 2017, more than six out of ten Pearson's shareholders voted against the chief executive's pay package of £1.5m after the company made a record loss. Pearson US has been criticised for using offshore tax avoidance schemes involving a host of companies at a service address in Luxembourg. In the United Kingdom, Pearson owns Edexcel, an education and examination board. Edexcel has produced qualifications which link to Pearson texts, although Edexcel also continues to endorse textbooks published by other companies. In June 2010, Pearson plc received notification that the Libyan Investment Authority (LIA) founded by Muammar Gaddafi's son Saif al-Islam Gaddafi as a sovereign fund, had acquired 24,431,000 shares within the company via Euroclear. On further investigation, Pearson said the LIA may have acquired an additional 2,141,179 shares, resulting in a total interest of 26,572,179 shares. At the time, this represented a major holding of 3.27% within the company and the investment was worth around £280 million. ^ a b c "Preliminary Results 2018" (PDF). Retrieved 10 March 2019. ^ a b Spender, J. A., Weetman Pearson: First Viscount Cowdray (London: Cassell and Company Limited, 1930). ^ "The World's 54 Largest Publishers, 2017". Publisher's Weekly. 25 August 2017. Retrieved 29 November 2017. ^ "Private equity to buy Pearson's IDC for $3.4 billion". Reuters. 4 May 2010. Retrieved 18 August 2010. ^ a b c d e f g "Our History". Pearson.com. Retrieved 18 April 2011. ^ "Engineering Timelines - Blackwall Road Tunnel, northbound". www.engineering-timelines.com. ^ "Centenary of the opening of the Blackwall Tunnel". 30 July 2013. ^ 'Southern Blackwall: The Blackwall Tunnel', Survey of London: volumes 43 and 44: Poplar, Blackwall and Isle of Dogs (1994), pp. 640–645. Accessed 17 March 2013. ^ Grace's Guide to British Industrial History. "Weetman Dickinson Pearson". ^ Funding Universe. "Pearson plc History". ^ "History of Pearson plc – FundingUniverse". Retrieved 26 March 2016. ^ "The Sennar Dam and the Gezira Irrigation Scheme", The Engineer Archived 4 January 2015 at the Wayback Machine (26 September 1924). Retrieved: 12 November 2015. ^ Andrew Garfield (25 June 1999). "Dragging Lazards into the 21st century". The Independent. London. ^ "Sir Isaac Pitman & Sons". The Arthur Conan Doyle Encyclopedia. Retrieved 8 May 2018. ^ "Granada and Pearson sell BSB stake BBC News, 1998". BBC News. 17 December 1998. Retrieved 18 April 2011. ^ "Pearson Sees Profits Fall 40 Percent, Selling Westminster Press Unit". Associated Press. Retrieved 23 August 2014. ^ Gilpin, Kenneth N. (10 February 1996). "Pearson to Buy a Publisher From News Corp". The New York Times. ISSN 0362-4331. Retrieved 23 August 2014. ^ By GERALDINE FABRIKANT WITH ALLEN R. MYERSONMAY 18, 1998 (18 May 1998). "Simon & Schuster In Sale To British - The New York Times". Nytimes.com. Retrieved 21 December 2016. ^ "Hicks, Muse, Tate & Furst to acquire Simon & Schuster's Reference, Business and Professional Divisions". Findarticles.com. 18 May 1998. Retrieved 18 April 2011. ^ "Pearson buys Dorling Kindersley". BBC News. 31 March 2000. Retrieved 29 December 2012. ^ "Pearson buys NCS". Faqs.org. Retrieved 18 April 2011. ^ "Pearson agrees to sell 22% stake in RTL Group". Findarticles.com. 2001. Retrieved 18 April 2011. ^ a b Rebecca Smithers and Kevin Massy (30 June 2003). "New marking fiasco". The Guardian. London. Retrieved 18 April 2011. ^ "Pearson Acquires Newspaper Concern For Hispanic Market". ^ "Pearson Knowledge Technologies". Pearsonkt.com. Archived from the original on 15 July 2011. Retrieved 18 April 2011. ^ "Pearson Education has agreed to buy National Education Systems". Allbusiness.com. 1 May 2006. Retrieved 18 April 2011. ^ "NES sold to global company". Daily Hampshire Gazette. Archived from the original on 7 May 2013. Retrieved 26 April 2006. ^ "Pearson acquires Harcourt Assessment and Harcourt Education International from Reed Elsevier". Pearson. Archived from the original on 14 December 2012. Retrieved 11 May 2013. ^ "Pearson Completes Acquisition of Harcourt Assessment". Assessment & Information group of Pearson. Retrieved 16 July 2011. ^ "Pearson To Acquire eCollege". Campus Technology. 16 May 2007. Retrieved 21 March 2015. ^ "M & F Worldwide Corp. Completes the Acquisition of Pearson's Data Management Business" (Press release). Pearson plc. 22 February 2008. Archived from the original on 8 April 2008. Retrieved 8 March 2008. ^ "Pearson buys Wall Street Institute for $92m in cash". The Book seller. 29 July 2010. Retrieved 21 March 2015. ^ "Pearson Buys Sistema Learning Unit for $499 Million". Bloomberg. 22 July 2010. Retrieved 21 March 2015. ^ "Pearson sells IDC stake for $2bn". The Guardian. London. 4 May 2010. Retrieved 21 March 2015. ^ "Royal Holloway to validate new Pearson degree". Times Higher Education. 4 July 2011. Retrieved 17 November 2012. ^ "FT owners plan college for business degrees". The Guardian. London. 14 August 2012. Retrieved 17 November 2012. ^ "Pearson to sell FTSE stake for £450m". The Guardian. London. 12 December 2011. Retrieved 21 March 2015. ^ Mark Sweney. "Pearson buys controlling stake in TutorVista for $127m | Business". The Guardian. Retrieved 4 December 2016. ^ "Random, Penguin merging to form leading publisher". Reuters. 29 October 2012. ^ "Pearson's world-leading English learning business strengthens its position in the corporate market". GlobalEnglish. Retrieved 31 July 2012. ^ Young, Sarah (25 February 2013). "Pearson sees 2013 flat, begins restructuring plan". Reuters. Thomson Reuters. Retrieved 18 January 2015. ^ Gordon, Kathy (23 May 2013). "Pearson details restructuring". The Wall Street Journal. Retrieved 26 June 2013. ^ Orihuela, Rodrigo; Schweizer, Kristen (25 July 2014). "Pearson cutting 4,000 jobs as first-half sales decline". Bloomberg. Retrieved 18 January 2015. ^ Henry Mance, Arash Massoudi and James Fontanella-Khan (23 July 2015). "Nikkei to buy FT Group for £844m from Pearson". Financial Times. Retrieved 28 July 2015. ^ "Pearson sells Economist Group stake". BBC News. Retrieved 12 August 2015. ^ a b Omar Oakes (27 July 2015). "Pearson to sell Economist Group stake". Brand Republic. Retrieved 28 July 2015. ^ "? meets ! in new Pearson logo". Design Week. Retrieved 26 March 2016. ^ "Pearson rebrand to reflect 100% focus on education". Retrieved 26 March 2016. ^ "Byju's acquires TutorVista and Edurite from Pearson | Forbes India". Forbes India. Retrieved 4 July 2017. ^ "Pearson sells 22% stake in Penguin Random. House". BBC News. 11 July 2017. Retrieved 12 July 2017. ^ "Pearson to axe 3,000 jobs after slump at main US business". The Guardian. 4 August 2017. Retrieved 18 March 2018. ^ "Pearson sells Global Education to Puxin for £62m". The Bookseller. 16 August 2017. Retrieved 12 September 2017. ^ Inc., Pearson Education,. "Pearson Launches Global Alumni Network to Strengthen Relationships Among Former Employees". www.prnewswire.com. Retrieved 29 October 2018. ^ "Pearson makes "significant changes" to structure". The bookseller. 23 May 2013. Retrieved 9 April 2017. ^ "Should Pearson, a giant multinational, be influencing our education policy?". The Guardian. London. Retrieved 25 September 2013. ^ "Pearson Draws Criticism From New York to Texas... Justified? Or Unjustified?". wiredacademic.com. Archived from the original on 28 September 2013. Retrieved 25 September 2013. ^ Mark Sweney. "Pearson shareholders reject chief executive's £1.5m pay package | Business". The Guardian. Retrieved 6 May 2017. ^ "When Pearson US took a tax break - Courtesy of PwC". World tax. 3 July 2015. Retrieved 2 June 2016. ^ "The Senior Management Team". Pearson Edexcel. ^ "Pearson freezes stake held by Libyan Investment Authority". The Guardian. 1 March 2011. Retrieved 26 March 2016. ^ "Pearson Publishes Gender Pay Report". www.pearson.com. Retrieved 23 March 2018. ^ "Pearson Gender Pay Gap Report 2017 - PDF" (PDF). Wikimedia Commons has media related to Pearson plc. Mary H. Munroe (2004). "Pearson Timeline". The Academic Publishing Industry: A Story of Merger and Acquisition. Archived from the original on 20 October 2014 – via Northern Illinois University.